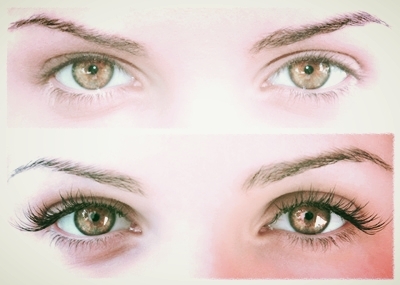 Semi-permanent eyelash extensions will give you longer, thicker and very natural looking eyelashes. They look so natural no one will know they are not yours! Eyelash extensions are worn by famous celebrities like Nicole Kidman, Paris Hilton,Gwen Stefani, Lucy Liu, Naomi Campbell and Kim Kardashian to name a few. But you don't have to be a celebrity to wear them. Women everywhere are catching on and becoming Lash Addicted! Extensions are perfect for everyday wear as well as special occasions. They are semi-permanent and made from synthetic fibers or naturally luminous, soft mink strands. Each lash is applied one by one to your own natural lashes. With proper care and touchup visits, your lashes can last a very long time. Normally a person's natural eyelash falls out every 60-90 days and a new lash grows in immediately. Therefore it is necessary to get touchup extensions to fill-in the fallen lashes. About every 2 to 3 weeks is recommended, however, this varies with each person. Your natural lash cycle as well as how well you take care of your lashes will affect how long they last. For Stephanie's clients, the look is so natural, and yet so luxuriously beautiful, they consider Flutterlashes781 their best kept secret to beauty on Boston's south shore. Isn't it time you let yourself in on this secret too? Applied one by one to each of your natural lashes, extensions bring out your eyes and add a refreshing level of youthful confidence to your appearance. There is no need for mascara with Flutterlashes781 extensions even though a water-based mascara is perfectly fine to use. The result is thicker, longer, eye opening lashes that are safe in the shower, while swimming, sleeping or exercising. Eyelash extensions have gained a tremendous amount of popularity in the last couple of years because the look is so natural and captivating. They also minimize the time it takes to get ready in the morning because you wake up "Camera Ready!" But we need to warn you of one thing...Fluttlerlashes781 extensions can become very addictive!